Fluence Corporation Limited (ASX:FLC) is pleased to announce that it has signed a landmark €165 million commercial agreement with the Federal Government of Ivory Coast for the turnkey supply of a 150,000 m3/day surface-water treatment plant (the “Plant”). 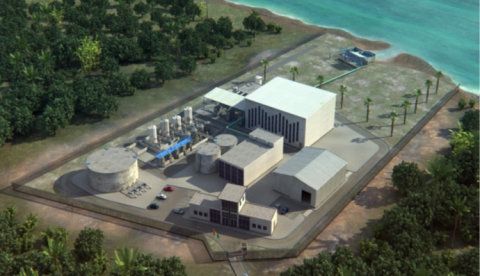 The Plant will treat water from Lagune Aghien, Ivory Coast’s largest freshwater reserve near Abidjan, which is dense with algae and other contaminants, to help meet the fresh water needs of the country’s largest city. With a population of 4.7 million people, Abidjan is in urgent need of reliable, potable water due to its growing population and housing development. The contract is conditional upon the arrangement of export credit financing, which Fluence is in the process of finalizing. The scope of work under the contract includes water intake, water treatment, bulk water piping, water towers and infrastructure. The Plant will include cutting-edge integration of proven technologies: smart intake, various separation and membrane systems, advanced oxidation, biological filtration and sludge treatment. The advanced multiple barrier design (ensuring water quality according to World Health Organisation standards) is an environmentally sound water treatment process that allows the flexibility to optimise operating costs in various feed qualities. The design combines Fluence’s suite of water treatment technologies and leverages the Company’s deep understanding of water biology and chemistry, different treatment methodologies, and experienced technical staff. Fluence is in advanced discussions to arrange third party financing for the Government of Ivory Coast via a loan from Israel Discount Bank. The project has the support of the state of Israel through its Export Credit Agency (ASHRA). Following Financial Close, which is expected to occur during Q3 2019, construction of the Plant will then commence, with completion occurring within 24 months thereafter. Subject to Financial Close and Project Commencement, Fluence expects that this contract will contribute revenues of up to US$20 million in 2019, US$80 million in 2020, with the balance of the contract value to be recognized in 2021. This will significantly increase Fluence’s contracted backlog for each of these years. Progress payments are expected to be made on a quarterly basis, and project financing will be further supported by a specific working capital facility. Additionally, Fluence has been invited to bid for an operating and maintenance contract, which could provide further recurring revenue, in line with the Company’s strategy of growing its recurring revenue base. Henry Charrabeì (Managing Director & CEO) and Francesco Fragasso (CFO) will host an investor conference call regarding this landmark contract. The conference call will be held on Thursday, February 28th at 9:00 am AEDT, Wednesday February 27th at 5:00 pm EST.